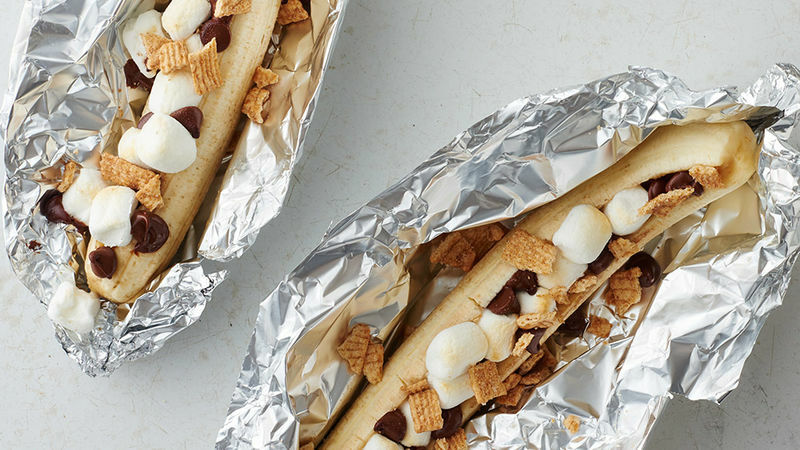 Wrap banana up in foil and cook on the grill for 5-6 minutes or bake at 400°F for 5-6 minutes and broil until marshmallows are lightly toasted. OVEN METHOD: Cook in the OVEN at 400°F for 5-6 minutes. CAMPFIRE METHOD: Keep peel on banana; slice lengthwise twice, lift up flap of peel, slice banana and add chocolate and marshmallows as above. Replace peel flap and wrap banana with foil. Let the flames die down before adding banana packets directly to fire. Cook 3-5 minutes, or just until soft and melty. Use tongs to remove from fire. Carefully unwrap and unpeel banana to eat. It seems like s’mores have been the star this summer, popping up in all forms from drinks to cupcakes. 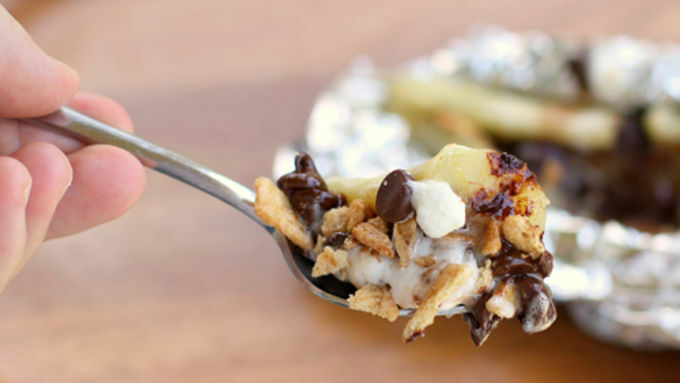 But there’s always room for one more ... and this s’mores tangent has a fruity twist. When you fire up the grill for its summer workout, you have to make these Grilled Banana Chocolate Melts. 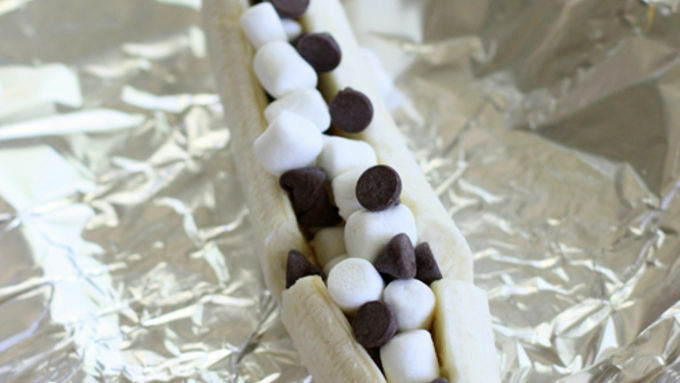 A banana is sliced down the middle and stuffed to the max with marshmallows and chocolate chips. Wrap it in foil and throw it on a grill for a couple of minutes to get a warm, decadent banana melt. A handful of crushed Cinnamon Toast Crunch cereal on top is all you need to add the graham cracker element of your s’more and the perfect amount of crunch to compliment the gooeyness of everything else. You’re gonna need a spoon for this one … that’s the only way to make sure you get every last morsel of chocolate and melted marshmallow.